One of my sleeper hits from last year’s SPIEL fair was Doodle City, a pathway building game where players try to connect up different parts of Doodle City via road segments. The same company, Aporta, has come back this year with a similar game which gives players a new planning problem to solve in the game. 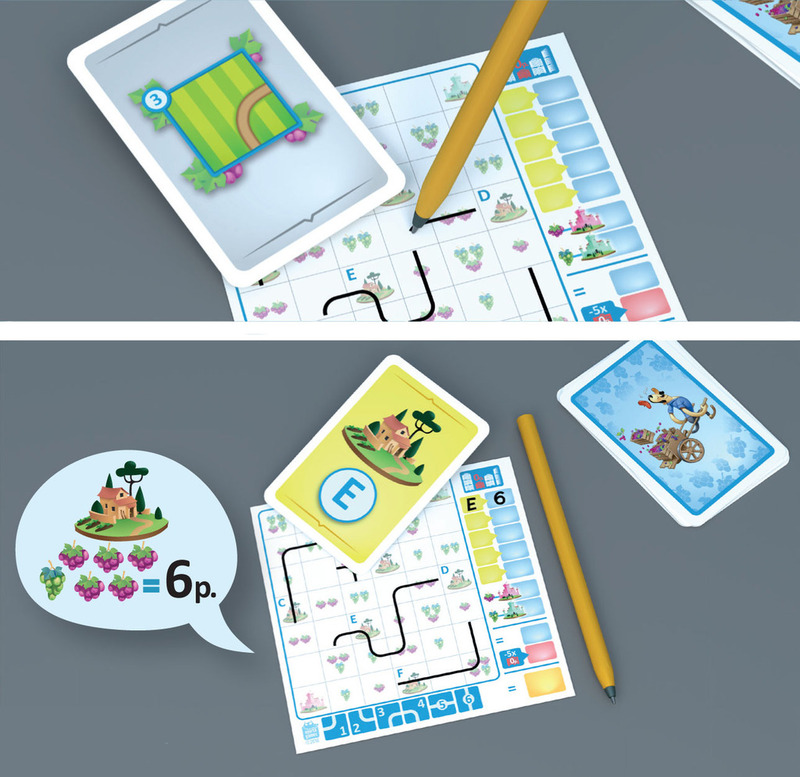 In Avenue, each player gets an identical map from the tear-off pad and a pen. This map is a 6×7 grid which has castles, farms, squares with grapes, and empty squares. There is a column of scoring spaces down the right hand side of the map which you will use at the end of the game. There are also two decks of cards: a farm deck made up of 6 cards and a road deck made up of 42 cards (20 grey and 22 yellow). The game is played over five rounds, and at the start of each round, the remaining cards in the farm deck are shuffled and one is chosen and flipped face up. The depicted farm is the one which will be scored in this current round. Then, one player takes the deck of road cards and turns the top card face up on the table. All players must now draw the road segment depicted on the card somewhere on their map. There are only six options, and all players must draw the same shaped road. There is a reference row of the six possibilities at the bottom of the map. The road segment may not be rotated – it must be drawn exactly as the segment is shown on the card and the reference row. Road cards continue to be flipped up (and players continue to draw road segments) until the fourth yellow card is exposed. After players have drawn in the road segment from that fourth yellow card, the round ends and players score. Each player looks at the farm being scored currently (from the Farm card at the start of the round), and then counts the number of grapes which is currently connected to that Farm. That number is written into the scoring space for the round UNLESS the new number is not larger than the number above it. In this case, you write a zero down instead. (Thus ties with the previous round will score you zero in this round…) All of the cards used in this round are discarded and will not be used again this game. Then, if there is still another round to go, a new Farm card is revealed and then road cards are again drawn until the next score – when the fourth yellow card is again revealed. This goes on until the end of the fifth round. Due to the distribution of cards in the decks, one Farm will never be scored in the game, AND it is impossible to see all of the road cards as there will always be at least two left in the deck at the end of the game. There is a bit of final scoring after the final round. There are two unlettered castles in the corners of the board, a pink one and a green one. 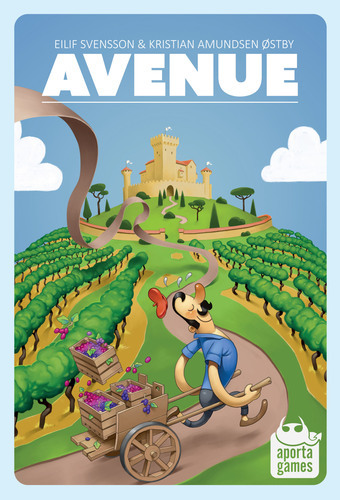 Players trace the road from each of these castles and score one point for each matching colored grape that is connected to the castles. Finally, a penalty of -5VP is taken for each zero written in a scoring slot above. All the numbers are summed, and the player with the highest VP total wins the game! Ties go to the player with the single highest score written in any scoring box. While the game looks similar to Doodle City from last year, it plays differently. When I first started playing the game, I worried a bit that the game might feel to static as you use the exact same map layout in each game. However, due to the unpredictable timing of the road cards coming out AND the varying order of the Farms to be scored, it’s highly unlikely that you’ll be able to make your roads connect up the same way. Sure, there are a few areas where you’ll have a preferred arrangement of roads, but the game may not allow you to patiently wait to play the same way each time. There is a bit of long-term planning that you need to consider as you play the game – are you going to try to score low in the first round and then continually build upwards in points? OR will you max out your score whenever possible and then take an occasional zero when you are unable to beat your previous round’s score? As the rules allow you to play your roads wherever you like, you don’t always have to try to connect them to the Farm currently being scored. You could set up a small area to the scoring Farm and then play the rest elsewhere in order to set up a larger score in a later round. This strategy could, of course, backfire on you if the right cards aren’t drawn and the game ends too early for you. I also had fears that everyone would end up drawing out the same network of roads with the identical setup and identical road segments, but this hasn’t happened in practice. Sure, there’s a bit of sameness in the first few roads if obvious choices come up, but once the maps diverge, they can never really come back together again. While it costs you the chance to draw in a road segment, I really like to take advantage of the passing rules in order to get some advance information on which Farm will score in the next round. I often need to do this in the fourth round so I can make sure that I am connecting the correct farm to my growing road network by the end of the game. While you don’t necessarily need to have a single connected system of roads on your map, the pink and purple castle bonuses at the end will definitely reward the player who was able to make a long contiguous road though the map. Games play quickly, and we can get in a game around 15 to 20 minutes now. Like Doodle City, this is a game that might actually play faster and more efficiently as a phone app, but we still get a lot of enjoyment watching each other agonize about where they’re going to play the next road segment… Aporta Games has a free app for Doodle City, and it would not surprise me if I found one for Avenue in the Play Store soon. This entry was posted in Essen 2016, Preview, Reviews. Bookmark the permalink.